Looking for a unique location? In need of a large open office space or storefront property? 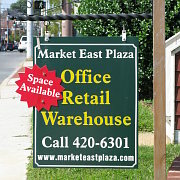 Market East Plaza has the following properties and spaces available for rental. Whether you are a prospective investor, proprietor or tenant, if you require further details on any of the below listings, please do not hesitate to contact us. We are currently updating the list of available units. If you have an immediate inquiry regarding certain space requirements, please do not hesitate to contact us.